In recent years, some esoteric top-fermented North German beer styles have joined the beer renaissance party. Leipziger gose and Berliner weisse, imported and microbrewed, are now familiar offerings. Kölsch is mainstream. Another, the Düsseldorf-style altbier, remains elusive and enigmatic. In Düsseldorf, the coppery, crisp and malty beer is the undisputed king. Rhenish cousin to Kölsch, altbier is proudly distinguished as being brewed in the old (alt) style of top-fermentation with dark malts, a counterpunch to the tsunami of pale lagers that flooded Europe in the 19th century. Düsseldorf, founded in 1288, is in North Rhine Westfalia, 25 miles north of Cologne (Köln). Rhineland brewers were less beholden to aristocratic interests than Bavarians and, hence, more independent. Unlike the Bavarians, they used top-fermentation and cellaring methods, similar to the Belgians and British. Northern Germany had numerous indigenous and regional beer styles into the 19th century, many now extinct. Leipziger gose, Münster altbier and Berliner weisse survived relatively unscathed, anachronistically featuring wild influence and raw or malted wheat. Kölsch and altbier became more-refined versions of these old styles, uniquely acclimated to the temperate environs and honed by technological innovations of the 19th century: pure yeast isolation, precision malting and refrigeration. With this methodological rigor, beer could be brewed year-round with the option of cold conditioning. Kölsch and altbier were similar until pale lagers crashed the party, with first mention of them as two distinct styles coming in the late 19th century. Cologne brewers shifted to very pale malt (a concession to the unrelenting popularity of golden lager), whereas Düsseldorf brewers stuck with darker Munich-style varieties. The designation of “altbier” was a firm, defiant nod to heritage (minus the lagering period, of course) that boldly set them apart. The most dynamic area of Düsseldorf is the Altstadt (Old Town), home to 200 taverns proudly pouring altbier. There are three brewpubs (hausbrauerei) here, and another just east. Zum Uerige (The Grouch), Im Füchschen (The Little Fox) and Zum Schlüssel (The Key) reside in Old Town, and Schumacher just outside. All feature house altbier. The other taverns serve these or altbier from two other local breweries, Schlösser and Frankenheim. At the brewpubs, hustling köbes (waiters) deliver altbier in small cylindrical glasses, served from oaken casks fetched from the cellar, breached with mallet and tap and dispensed under gravity. The culture is entertaining, friendly and steeped in tradition, but the real star is in the glass. Düsseldorf altbier is made with German lager malts, its orange-copper color extracted from proprietary blends of pilsner, Munich, caramel and/or roast. The fiery autumnal hue and malty aroma is instantly recognizable as Munich malt, whose toasty footprint graces dark bocks, dunkels and Märzen. The base grist may be entirely composed of Munich or blended with lighter pilsner malt. In either case, the malty character is as aromatic and flavorful as any German lagerbier. The body is lean, slimmed by low mash temperatures and attenuative yeast. Residual sweetness is low, as is a biting, lingering bitterness, in spite of high hop rates of 35 to 50 IBUs. Spalter hops, a noble variety grown in Spalt in Bavaria since the 14th century, is the traditional cultivar. Other noble varieties such as Hallertauer and Tetnanger may also be used. And while altbier is not a hoppily aromatic brew, the mellow, herbal noble background impeccably flatters the svelte malty flavor and aroma. Unique yeast, culled over time under fermentation conditions particular to altbier and Kölsch, is yet another crucial contributor. It toils at low top-fermentation temperatures where others would struggle to thrive, 55 to 60 degrees F. Fermentation is clean and thorough. Original gravities of 11 to 12 degrees Plato give altbier an ABV of 4.5 to 5%. Slow, steady fermentation is followed by a few weeks of near-freezing lagering. This cold conditioning supplanted cellar aging after the invention of refrigeration. Did the brewers change to emulate the ubiquitous and popular lagers, or is it a side benefit afforded them to store beer after the invention of refrigeration? Either way, altbier is called obergärige lagerbier (top-fermented lager beer), a hybridized brew native to the Rhineland. Special or seasonal versions are made by Düsseldorf brewpubs periodically. They are more robust all the way around than the brewpubs’ standard offering. Zum Uerige’s is called Sticke (secret); Zum Schlüssel’s Stike (also secret) and Schumacher’s Latzenbier (beer from the wood). Im Füchschen offers its as a Christmas specialty, Weihnachtsbier (Holy Night beer). Other notable altbiers include Frankenheim and Schlösser of Düsseldorf and Diebels of Issum. All three were once available in North America, but are now rare or absent. Thankfully, Zum Uerige’s triumvirate of regular altbier, Sticke and Doppelsticke, can be purchased in the U.S.
Münster has a long tradition of brewing top-fermented wheat beer, and that lives on in its unusual, but authentic, interpretation of “old” beer. Pinkus Müller organic altbier contains 40 percent wheat, is golden and hazy. The fresh hoppiness, bright malty character and neutral yeast are in keeping with the Düsseldorf style, albeit much lighter in color. American altbiers are, curiously, a rather underrepresented genre of the style. Alaskan Amber of the Alaskan Brewing Co. in Juneau is the most famous of them. It’s copper-brown, very malty and robust, with somewhat reserved hop bitterness. Olde Mecklenburg Brewery in Charlotte, North Carolina, may make the best, most true-to-style altbier in America. Maybe the popularity of Kölsch, gose and Berliner weisse in recent years will inspire our brewers to brew more altbier. Brewers do, after all, hate a vacuum. Stay vigilant: Altbiers do appear on menus from time to time. Editor’s Note: In an earlier version of this story, several beers were attributed to the wrong breweries. Correct attributions are as follows: Im Füchschen brews Weihnachtsbier, Zum Schlüssel brews Stike, and Schumacher brews Latzenbier. Tasting Notes: From the Altstadt, this unfiltered and unpasteurized brew is the only brewpub Düsseldorf altbier available in America. It has been brewing since 1862. This pours full copper-brown and slightly hazy with tall, sticky foam. Toasty, malty and bready aromatics are overlaid with an unmistakable spicy German hop nose. Medium-light-bodied, with dark malts that are impressively flavorful for the ABV. The hop flavor and firm bitterness lend a rustic, earthy background. 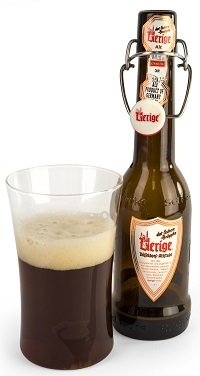 Uerige also exports the more hoppy and aromatic Sticke (6%) and the formidable Doppelsticke (8.5%) in bottles. Draft can also be found on occasion. A true taste of the Old Town. Tasting Notes: Olde Mecklenburg opened its doors in 2009, dedicated to making authentic German-style beers, a rarity in the South. It is easily one of the best breweries in the region, and its altbier is reason enough to seek the brewery out. Bright, clear and glistening copper, it has an elegant spicy, grainy and malty aroma, with hops in the background. Smooth and silky on the palate. The graininess and toasted malt in the aroma revisit the flavor. With 31 IBUs, OMB Copper is decidedly malt-accented yet refreshing, with many of the same qualities we look forward to in autumnal Märzen. Tasting Notes: This altbier is considered a “one-off” relative to the Düsseldorf style, but Pinkus can rightfully claim it as such since it is a true and exclusive vestige of an old Münster style. Pinkus Müller has been brewing in Münster since 1816. Full gold with a dusty haze, it has a head of pure white. The hops are herbal in the nose, and there is some light maltiness reminiscent of Munich helles, and gentle fruitiness. The wheat portion (40 percent) and lactic influence provide quenching acidity in the flavor and a dry finish, while the finesse of the pale barley malt offers up delicate sweetness. Fairly light on the mouthfeel, it is unfiltered and cold-conditioned for several months, resulting in a naturally velvety smoothness. – Frankenheim, Schlösser are only “trademarks/brands” which were soled years ago and produced OUTSIDE Düsseldorf and not regarded as local brews! Diebels from Issum is NOT Düsseldorf Alt, but still largest producer of Altbeer. I managed to place into the ‘Best in Show’ round of my very first homebrew competition 2 years ago with an alt which I admit was an unusual yet tasty creation. About 6 months later I found myself at Laurelwood brewpub in Portland having their alt and trying to discern how it was different from mine. I’ve always liked the style and may dive into ithe again with some refinements from the story above, thanks for an enlightening read. Another good one is the Alternating Current Altbier from Gizmo Brew Works in Raleigh, NC. Only available in the fall and I try to get my hands on it when I can. I’m not sure why more breweries haven’t picked up on this style but I enjoy it very much.